Pity the poor heroine of Ron Butlin’s Ghost Moon. Maggie Davies is subjected to more abuse, rejection and humiliation than most mortals can stomach. Cast out of her parents’ home in 1950s Edinburgh for being pregnant and unmarried, we follow her as she veers from place to place, suffering torment after torment in a world that seems firmly set against her from the start. Men are cruel to her, women even crueller, and her pious, judgmental family shows her nothing but disdain. Even in the present day, as Maggie’s adult son Tom visits her in a care home, she is in the cruel grips of dementia, figures and events from her past merging with those of her present as the tangled threads of her life combine to torment her. Narratives with such grim subject matter can often veer into voyeurism or mere titillation, descending finally into a sort of fictional misery memoir; but in the hands of a writer as skilled as Butlin something rather different happens. Yes, far out at sea—that was where she really was. No land in sight and her only cargo her unborn child. Men, it seemed, always had some sort of harbour to make her. That was the nature of their world—a map of place names like Normandy, Amiens, Berlin. For men it was enough to identify aims and objectives, and then draw co‐ordinates—that done, and with bayonets fixed, they marched, marched, marched into the future, whatever the cost. Worse still is the way in which women are penalised by a religion that operates on a system of breath-taking hypocrisy. The God worshipped by Maggie’s parents insists on neat hair but not on a mother supporting her daughter during a crisis. When a young Maggie sees her mother meticulously combing her hair, despite the fact that she is about to cover it up with a hat, she comments: ‘But no one sees through your hat, Mum’. God does, little one, replies her mother—and so do other women. A particularly chilling scene involves Maggie’s parents pretending their daughter is simply not in their living room when she is, in fact, standing right in front of them. As she pleads with them to help her, they play the football on the radio louder and louder until they drown her out. When Maggie, defeated, goes upstairs to her bedroom she finds that it has been gutted. Thank God, then, for the kindness of Maggie’s down-to-earth sister-in-law Jean, a baker who allows Maggie to stay above her place of work when she is cast out by her awful family. Garrulous Jean smokes, talk in a thick Scots dialect and offers Maggie respite from the harrowing events of her life: ‘It’s my own fault, Jean. If I hadn’t let myself be—’, says Maggie, blaming herself for her troubles. ‘Dinna talk daft,’ replies Jean. ‘That’s the wey men talk, but we ken better.’ Maggie, understandably, finds herself ‘storing up Jean’s cheerfulness inside her’ like an antidote. The smell of the leather seats, the heavy rain clattering onto the thin metal roof only inches above her head. The offer of whisky from his hip flask […] The memory made her want to gag, to turn away like she was still trying to avoid the man’s lips, to squirm away from his touch. Maggie is told to ‘forget all about’ her son; as if that were humanly possible. She is forbidden to breastfeed him, an infuriating command which goes against nature. Powerless, she is told by the women of Woodstock House: ‘[…] we’ve been very patient with you, letting you come and go as you please, letting you take him for a quick tour round the block from time to time …’, and, finally, is given no further access to her baby. Maggie seeks and finds employment in Fusco’s Fish Restaurant on Gorgie Road by displaying a similar level of gumption. She walks ‘straight in’ to the chip shop and bags herself a job, displaying little timidity. When the women of Woodstock House forbid her to breastfeed her baby she simply ‘shift(s) Tom to her other breast’. She uses fake personas and weaves a web of lies in order to gain a better job: ‘[…] during the week when she visited Tom at Woodstock House she’d say she was out at Gogarburn visiting her invalid husband; at the weekends she’d say she was going to Flotterstone to see Tom. A bit complicated, but couldn’t be helped.’ She proves herself to be a cunning and single‐minded survivor. The dead woman’s bed stood in the corner. Opposite was a family‐sized tombstone of a wardrobe that reeked of shoes, old clothes and camphor. The top of the dresser was a clutter of postcards, photographs, some letters in a rack, a comb, nailfile, a Present from Dunbar ashtray; wisps of greyish hair were tangled among the bristles of the hairbrush. Maggie dumped the lot into an old tartan shopping bag she found hanging behind the door, to go out in the next bin collection. A whole life reduced to rubbish. Struggling to get to your feet, pointing your finger at the screen: “That poor, poor woman. CAN’T SOMEDOBY DO SOMETHING? CAN’T SOMEBODY HELP HER? HELP HER HELP HER HELP HER!” Next moment it’s all turned to horse‐racing and a red‐faced man talking into a microphone. Which is nothing much, so you sit down again. The horror of one’s own mind becoming an unreliable place is, for some, worse than death. Such weighty themes are buoyed by Butlin’s gem‐like style of writing. His use of imagery is consistently playful, injecting light into the darkness of his protagonist’s situation. Whether he is describing Maggie’s bed as a pie (‘she could hardly wait to climb in under that welcoming crust and get baked to sleep’) or linking her longing for rest with the drudgery of her work in the chip shop (‘she’d stay in bed and enjoy a double‐shift of deep‐fried sleep’) his prose elevates the story into pleasurable territory. He captures the atmosphere and geography of 1950s Edinburgh, its streets and trams and shops, with panache, and whilst the subject matter is fraught with sorrow, Butlin’s stylish writing means the painful events of Ghost Moon, though never less than affecting, can be read with relish. 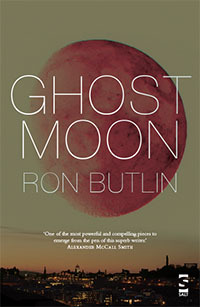 Ghost Moon by Ron Butlin is published by Salt, 2014.